The Johnson Level Tool 99-006K has its own pros and cons. It is from such pros and cons that you have a better chance of finding out if the product will work for you or not. These special features are what makes the Johnson Level Tool 99-006K Rotary Laser to be different from what you have used before. You will have an easier time to use this self-leveling tool even for those who are new to the field. Check out the special features and benefits below. When you end up going beyond the leveling range, there is an alarm goes off to give you a notification. This is with an aim to help you stay within the leveling range at all time. Want to find a Johnson rotary laser with longer working range? Check the Johnson 99-028K here. Most people find it hard to set the leveling tools. That has to change starting today when you switch to the Johnson Level Tool 99-006K Rotary Laser. The manufacturer offers clear instructions in the product manual that will help you to get started. Whenever you turn on the laser level, it will simply level itself both on the X and on Y-axis giving an easy time setting it up. A machine with impressive versatility makes it great for any job that you might have. For this Johnson rotary laser level, it can be operated at different speeds of 200, 400 and 600 RPM. You will simply switch to different speeds based on the application at hand. The lower speeds are commonly used to enhance beam visibility while the higher speed is common with outdoor use. You do not have to keep on worrying about the tool housing unit. The Johnson Level Tool 99-006K Rotary Laser is made to be tough enough to handle different job sites. It will withstand the different job site hazards and protect your tool while transporting. The inner components of the tools are easily protected by the use of an enclosed beacon. The components are protected from water and dirt that might just damage the laser tool components. This means Johnson 99-006K Rotary Laser Level will last longer ensuring you get the value for your money. You will have an easier time working on your leveling activities with this machine as it is built to handle different applications. Setting it up is no trouble at all as the processes are quite clear in the manual. Disassembling it should not be hard at all. You can take it down easily before safely storing it in the carry case. 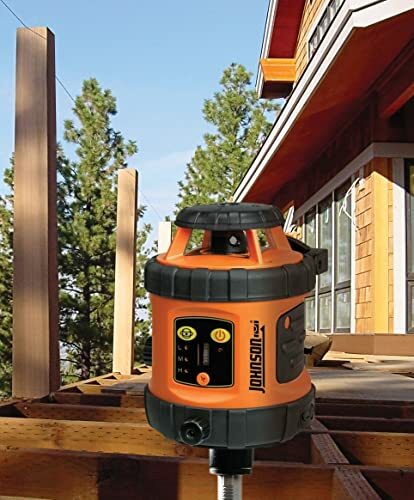 For the Johnson 99-006K Self Leveling Rotary Laser to work properly, it needs the best maintenance you can think of when it comes to laser tools. Still, the manufacturer has indicated the proper use and maintenance of all the components of this tool. If you are going to oil a few moving parts, ensure that you use the correct oil. Using the wrong products for maintenance will lead to serious performance issues. You would not want to spend a lot more on buying another kit since the other one will not be working effectively. See also: What is The Best Laser Level For Tiling Floor? The whole idea of self-leveling has made this Johnson rotary laser level get quite a reputation. This means that you will have much less time to set it up when you need to use it. Switching from one rotary speed to another is based on your application. Since you have a variety of speeds to use, the Johnson Rotary Laser Level 99-006K is seen to be versatile. The alkaline batteries that power the laser last long enough to keep you from going back to the store for more after a few weeks. Such features and many others make the leveling tool quite appealing to people searching for a rotary laser level. 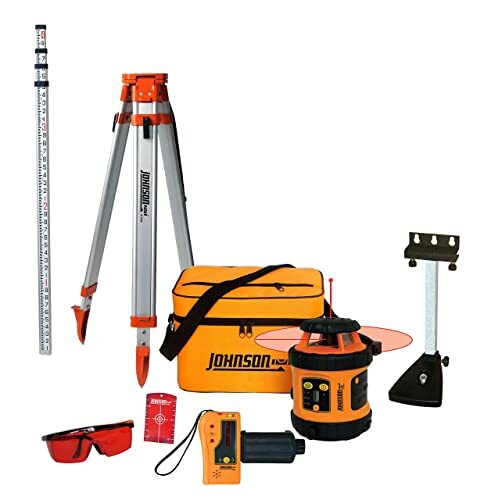 Moreover, being such a complete kit sold at an affordable price, the Johnson Rotary Laser Level 99-006K has become the best rotary laser level for homeowners. See also: How to Install Cabinets With a Laser Level?